A storm packing blizzard conditions spun up the East Coast early Tuesday, pounding coastal eastern Long Island into Maine with high winds and heavy snow, but it failed to live up to the hype in big cities like Philadelphia and New York, which canceled its travel ban amid better-than-expected weather conditions. Eastern Long Island north through Massachusetts and Maine were expected to fare the worst, with 1 to 3 feet of snow, punishing hurricane-force winds and the possibility of some coastal flooding, according to the National Weather Service. Travel bans in New York City and New Jersey were lifted Tuesday morning and New York City subways and buses were expected to roll again later in the morning. A look at the snowstorm from 30 Rockefeller Plaza between 7:30 p.m. on Jan. 26 and 3:30 a.m. on Jan. 27. The blizzard warning remained in effect Tuesday in Long Island's Suffolk County and all of Connecticut east of Fairfield County, while winter storm warnings or watches are in effect for the rest of the region. SNOWSTORM VS. BLIZZARD: WHAT'S THE DIFFERENCE? The National Weather Service issued a blizzard warning for a huge swath of the region, meaning potential whiteout conditions as heavy snow swirls amid gusting wind. The weather service said a blizzard includes sustained or frequent wind gusts of 35 mph or greater and considerable falling snow that lasts for at least three hours. The storm's intensity was downgraded for some major cities, including New York City, early Tuesday. Yeti on the Loose in Boston? Gusty winds blew through the northeast, with sustained winds of 15 to 25 mph. The NWS said higher gusts were reported from New Jersey to near Boston, where the winds were clocked at 40 to 50 mph. The weather service says a wind gust of 78 mph was reported on Nantucket, and a 72 mph gust was reported in Aquinnah on Martha's Vineyard. Airlines canceled nearly 7,700 flights Monday and Tuesday because of the storm. United Airlines canceled all flights in Boston, New York and Philadelphia on Tuesday. New York's LaGuardia Airport had half its flights scratched Monday. Boston's Logan Airport and Rhode Island's T.F. Green were closing Monday evening and no flights were expected to land or take off at either airport Tuesday. Amtrak suspended service north of New York and reduced its schedule for trains operating south of New York. Northeast Regional and Acela Express services were operating on a reduced schedule between New York and Washington. New Jersey Gov. Chris Christie said New Jersey Transit will resume limited service Tuesday afternoon. In the Boston area, officials suspended all MBTA transit service Tuesday. Gov. Cuomo said system-wide MTA service would come online at 9 a.m. and was expected to be running on a weekend schedule capacity -- about 60 percent of weekday service -- by noon. MTA officials initially believed they could keep the underground subway service running through the blizzard, but Cuomo apparently overruled that later mon Monday, citing worsening conditions. He Cuomo acknowledged the storm was "less destructive than expected," but stood by the emergency declarations, saying the travel bans and mass transit restrictions helped officials clean up faster than they would have been able to otherwise. Light snow was falling in New York City Tuesday morning, which got about 7-10 inches of snow. 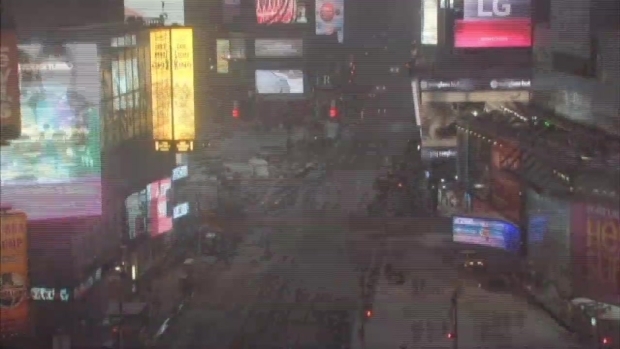 Watch as the snowstorm moves through Times Square over a period of nearly 12 hours. Travel bans implemented for the Hudson Valley and Nassau County as well as counties upstate were lifted. Only Suffolk County remained locked down by 8 a.m. Tuesday. Governor Cuomo announced a travel ban in 13 downstate counties on Monday, urging commuters and motorists to get home well in advance of the snow. New York City streets were only available to emergency vehicles starting late Monday, when the subway system shut down. All Broadway theaters were closed. 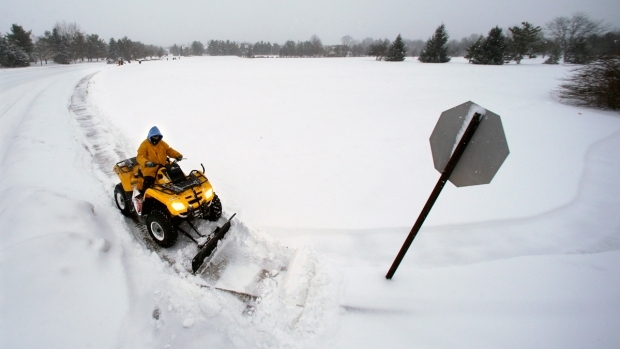 Facing blizzard warnings and doomsday snow forecasts, the governors of New York, New Jersey and Connecticut declared states of emergency Monday in anticipation of the storm. But for much of the area, it fell fall short of expectations as far as snow totals and wind damage. Flooding at the shore was a concern. The storm continued to pound eastern Massachusetts, Rhode Island and eastern Connecticut Tuesday morning, where accumulations could reach 2 feet. Boston is virtually shut down, but places farther south are reopening. Nantucket was experiencing "severe flooding" of up to seven feet of water in some areas while downed power lines left 1,300 on the island in darkness, emergency officials said. Marshfield was one of the low-lying towns on the Massachusetts coast being hammered by the storm surge. Near-hurricane force winds were predicted for Cape Cod and the nearby islands. The Town of Scituate, about 20 miles southeast of Bosotn, cut power to a section of the municipality during Monday's blizzard in an effort to prevent fires due to flooding. More than 20,000 homes and businesses across New England are without power as a blizzard battered the region. Blizzard warnings are in effect through midnight Tuesday into Wednesday for New Haven, Fairfield, Middlesex and New London counties and through 1 a.m. Wednesday for Hartford, Tolland and Windham counties. A state wide travel ban took effect at 9 p.m. Monday and Gov. 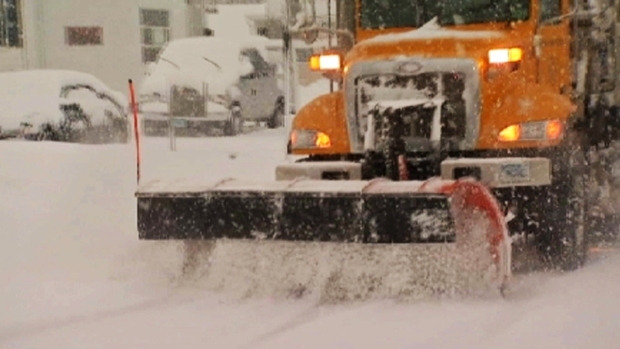 Malloy declared a state emergency ahead of the storm, which has the potential of bringing as much as 25 inches by Wednesday morning, NBC Connecticut reported. The heaviest snowfall is expected through mid-morning on Tuesday. "It's imperative that you have a plan in place to get home safe this evening," Malloy said Monday. Gov. Gina Raimondo told Rhode Island residents to prepare for 2 to 3 feet of snow and expect to potentially be without power for days. Travel was banned indefinitely on all roads starting at midnight, and three major bridges were shut down. Officials repeatedly urged people to not only stay off the roads but stay indoors. "Stay in your house until you hear otherwise," Raimondo said. State government, including the court system, was closed Tuesday, several cities and towns declared parking bans and public transit bus service was suspended. Gov. Paul LePage declared a state of emergency and announced that all state offices would be closed Tuesday. LePage cited the forecast for winter storm and blizzard conditions, as well as the potential coastal flooding in southwest Maine. The storm that shut down New York and much of New England on Monday and Tuesday shifted east, sparing Philadelphia and its suburbs from a crippling blow and prompting city officials to lift a snow emergency early Tuesday. Philadelphia, initially predicted to get about a foot of snow, got about an inch. But more than 80 percent of flights in and out of Philadelphia International Airport were canceled Tuesday. Stranded passengers were given cots, pillows, blankets, bottled water and snacks. Light snow may continue to fall in parts of the D.C. area early Tuesday morning, but the main problem region-wide will be icy roads, NBC Washington reported. Federal agencies in the D.C. area are on a two hour delay, but employees can take unscheduled leave or work from home. Winter storm warnings and winter weather advisories are in effect for counties in Maryland, Virginia and West Virginia until Tuesday afternoon. Mayor Warns New Yorkers: "Prepare for the Worst"
A paralyzing blizzard with white-out conditions is expected to dump more than two feet of snow on the Tri-State region, and Mayor de Blasio is urging New Yorkers to "prepare for something worse than we have seen before." Ida Siegal reports.